The study also involved University of Notre Dame doctoral candidate Samuel Rund and then-undergraduate student Samuel Lee, Class of 2013, and was in collaboration with researchers at the University of Wisconsin School of Medicine and Public Health, headed by Rob Striker. The team looked at two species of mosquitoes to see if there were changes in their flight activity following pharmacological manipulation that mimics a dengue virus infection. The work at Notre Dame was based on flight activity measured with infrared beam breaks, while the work at Wisconsin was based on microphones to measure the insects’ wing beats. The mosquitoes were exposed to a compound that activates protein kinase G, or PKG, a substance that modifies a particular behavioral pathway in mosquitoes, which then increased their activity. The pathway was known to regulate the behavior of non-disease-carrying insects, but had never been used in experiments with mosquitoes. 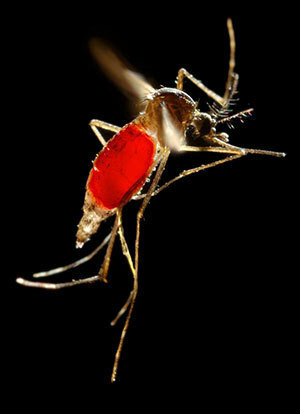 The results showed increased flight activity in two different species of mosquito, Anopheles gambiae, the night-active and major malaria vector, and Aedes aegypti, a day-active species responsible for transmitting dengue, yellow fever and West Nile virus. Understanding the molecular mechanism by which flavivirus, such as dengue, yellow fever and West Nile, can manipulate the behavior of the mosquito — thereby increasing the odds that the mosquito will encounter another human host and thus transmit the disease — is important to combating disease transmission. People infected with the West Nile virus develop symptoms but may not even know they have the illness. In severe cases, the virus may cause dramatic and dangerous symptoms leading to death. Nearly 5,700 people in the United States were diagnosed with West Nile virus in 2012, resulting in 286 deaths. Globally, dengue fever, a tropical disease that may cause a high fever, severe pain in the joints, muscles and eyes, headaches and bleeding, are increasing. It is thought at least 100 million dengue infections occur annually, resulting in 12,000 deaths, most of them women and children. There are currently no vaccines to prevent West Nile virus or dengue fever. The Eck Institute for Global Health is a University-wide enterprise that recognizes health as a fundamental human right and endeavors to promote research, training and service to advance health standards for all people, especially those in low- and middle-income countries, who are disproportionately impacted by preventable diseases.